On all of these randymajors.com mapping tools, you always had to start by typing in a city, address, place, etc. and then clicking the "Go!" button. Now with this latest enhancement, if you want to know more about your current location, you can just click the "Use current location" buttons (shown at left and highlighted in red below) and the map will immediately zoom in to your current location. Depending on which of the above tools you're using, once the map zooms in, the name of the current county, ZIP Code, or historical county will appear, along with all of the applicable boundaries. Feel free to share in the comments if you have other uses for this! 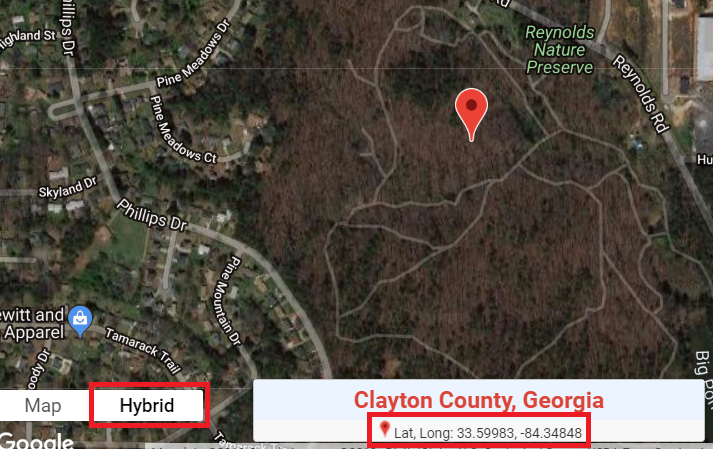 Technical note: The "Use current location" functionality will be more accurate on smartphones and other devices containing a GPS. 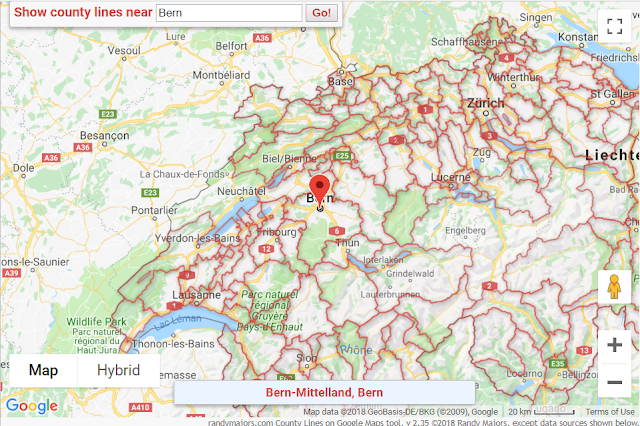 It will work on most desktop browsers as well, but will typically be more of an approximate location. 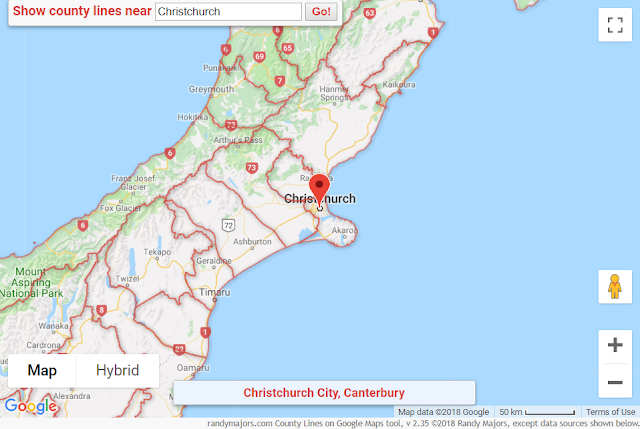 Background: Over the last couple of days, there had been many reports of "over query limit" and rate-limit problems when people were using the above tools. Working with Google support, those limits have been reset. 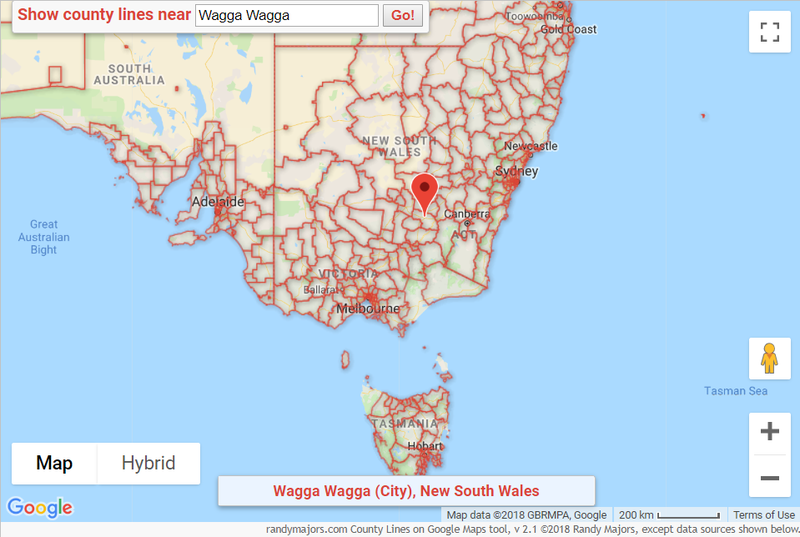 This issue was caused by pricing changes that Google has put in place for users of the Google Maps API, upon which the randymajors.com website relies. The bottom line is that the website has the potential to become quite a bit more expensive for me to maintain. As I want keep these tools free and unlimited for everyone, the only way to partially offset these costs is if users of the website click on ads when they find them useful. Thank you for your patience and for your support of these freely available tools. 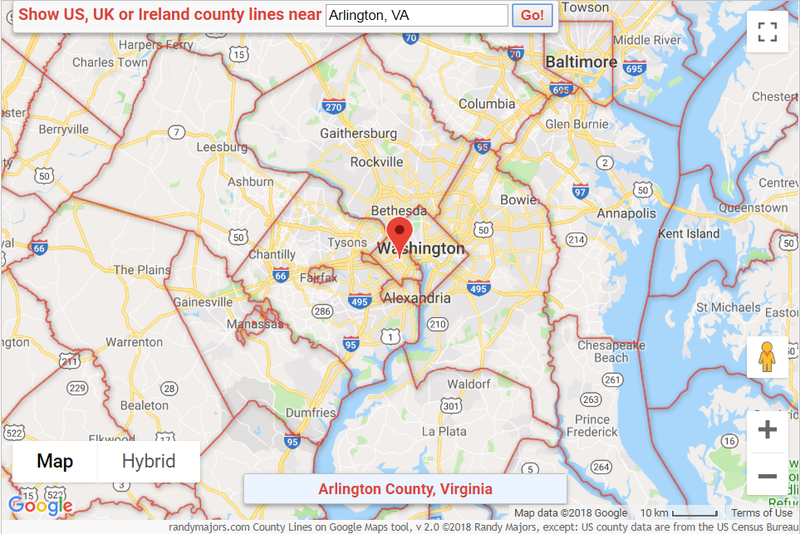 First County Lines, now ZIP Code boundaries on Google Maps! 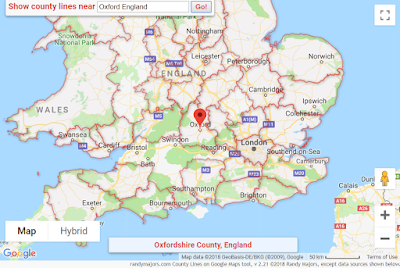 After the great response to my County Lines on Google Maps tool, I've heard a number of suggestions for other types of boundaries that Google Maps doesn't show. One that has come up a number of times is for ZIP Codes. Yes, you can see one ZIP Code boundary at a time on Google Maps desktop version, but that's of limited use if you're trying to see all of the ZIP Codes in an area and don't know what they are (for example, it's not intuitive how to get Google Maps to show the ZIP Code boundary for the place adjacent to the current ZIP Code you're viewing). 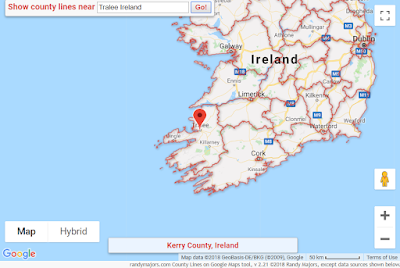 As with the other tools, just type any address or place name, then click Go! 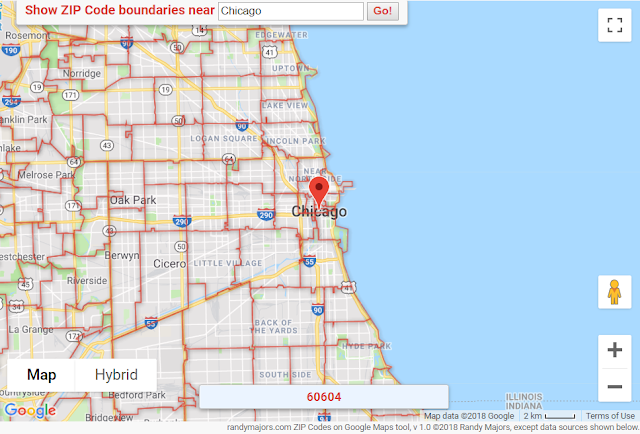 Zip Code boundaries will appear near your chosen place, and the ZIP Code will appear at the bottom of the map, as with this example around Chicago. 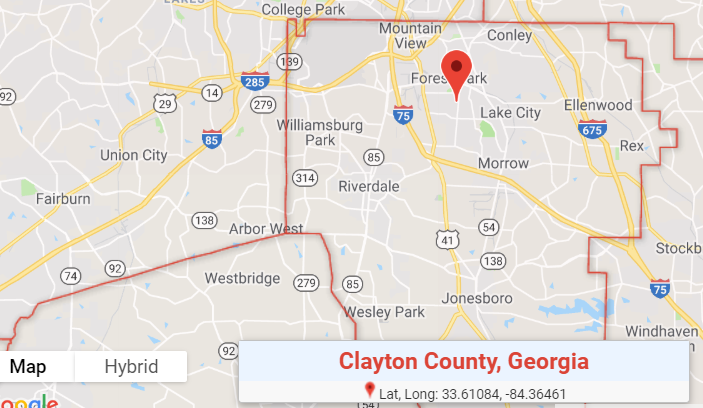 Click around on the map to see the ZIP Codes for where you clicked, or type another address or place name to see the ZIP Code boundaries there. Sorry for those outside the U.S., this tool currently only supports U.S. locations. Depending on demand, I may add postal codes for other countries in the future. Please feel free to leave any comments or suggestions below, and share with anyone you think may find this tool useful. I know many readers of this blog are mostly interested in genealogy and historical research. But did you ever notice that Google Maps doesn't display all of the county boundaries? Not even current boundaries, let alone historical! 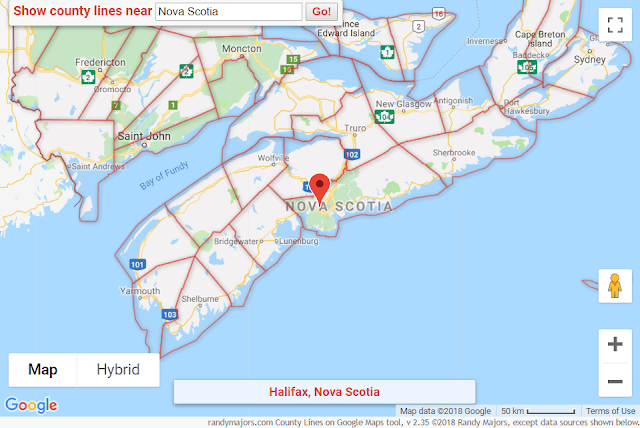 Well, what if you want to see all of the current county lines in Google Maps? 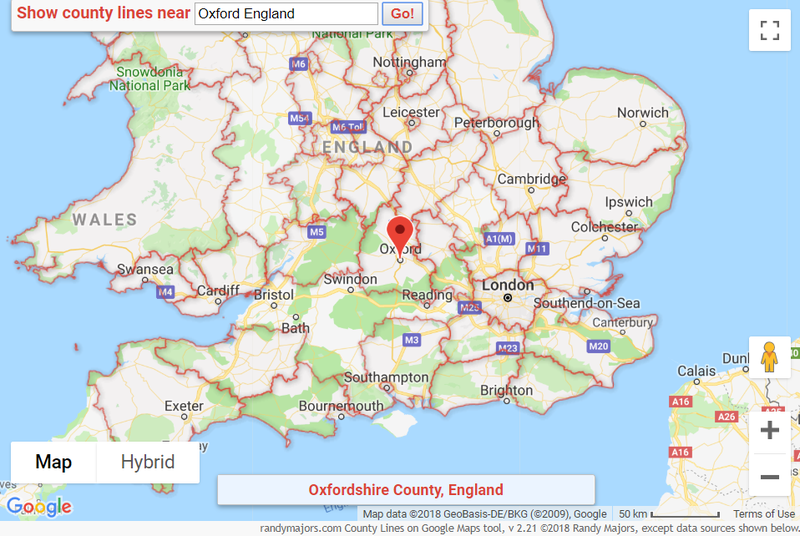 UPDATE: In addition to the US, you can now also view county lines in the UK, Ireland, Australia, New Zealand, Canada, and Switzerland. You'll see all the county borders for the state you're looking at, drawn on top of a fully functional Google Map! Feel free to share if you find it useful! TIP: Enlarge the map to full screen by clicking that button in the upper right corner of the map! Note: US coverage includes all 50 states plus Puerto Rico, US Virgin Islands, Guam, Northern Mariana Islands and American Samoa. 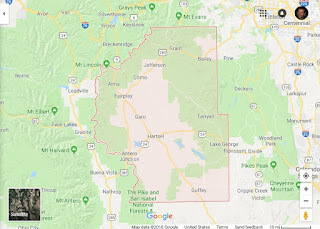 OK, let's say you're searching in the 1880 United States Federal Census for an ancestor that you know lived in Denver, Colorado at that time. The ancestor's name is James Smith and you think he was born sometime around 1850.
search form, as shown at right. 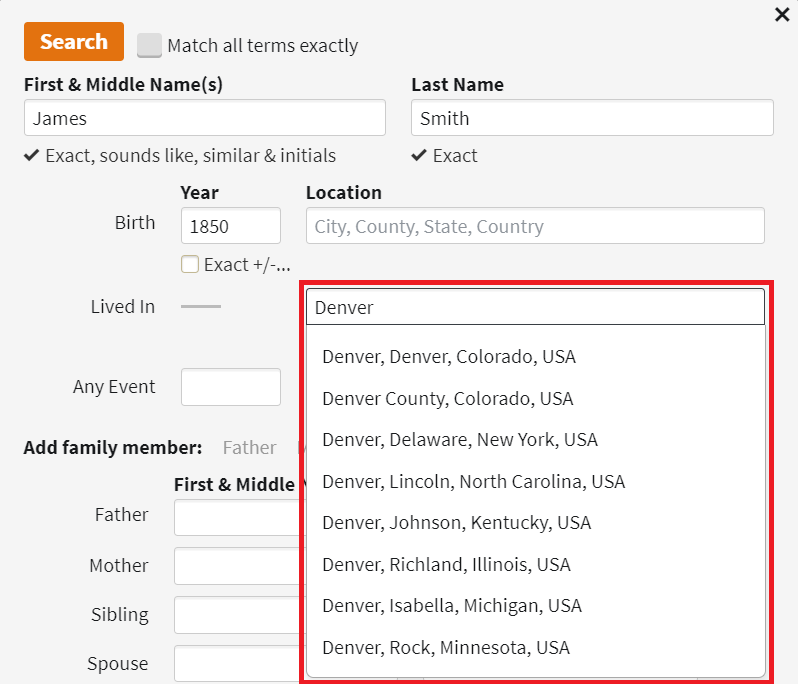 As you start typing "Denver" into the "Lived in" box, Ancestry very kindly offers you suggestions. 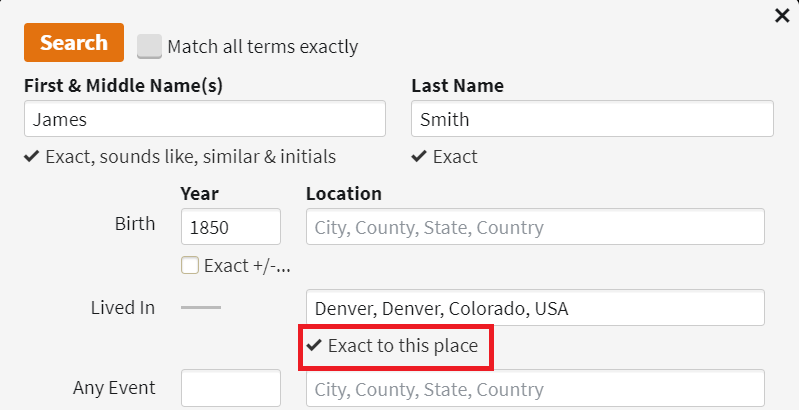 You think to yourself, "Why thank you, I'll choose the first option, 'Denver, Denver, Colorado, USA'. Sounds about right." 7,611 search results! Ouch. And that's with the "Exact" boxes checked next to the First and Last Names as shown above. So you think, "Hmm, time to edit my search and check some more 'Exact' boxes so I can narrow down my search results." 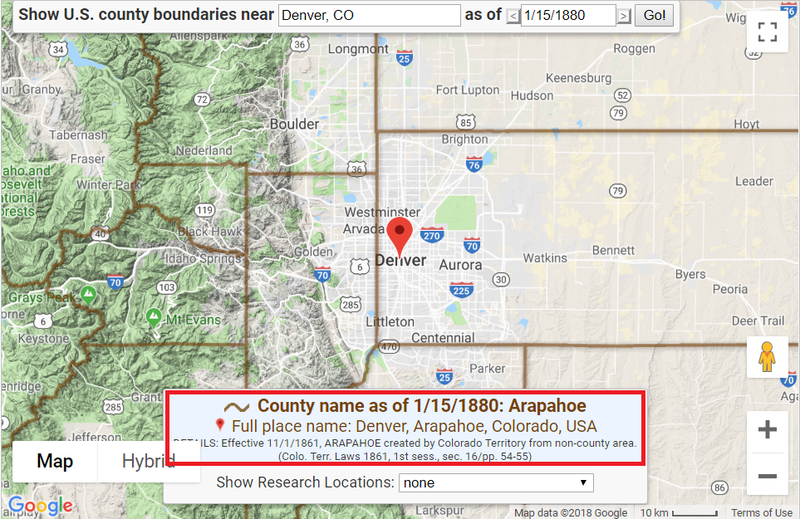 Since you know your ancestor lived in Denver, you check the "Exact to this place" box, as shown at right. Assuming this should give you what you're looking for, you click Search. "Wait, how in the world could there be ZERO results?! ", you fume. "And for a common name like James Smith??" 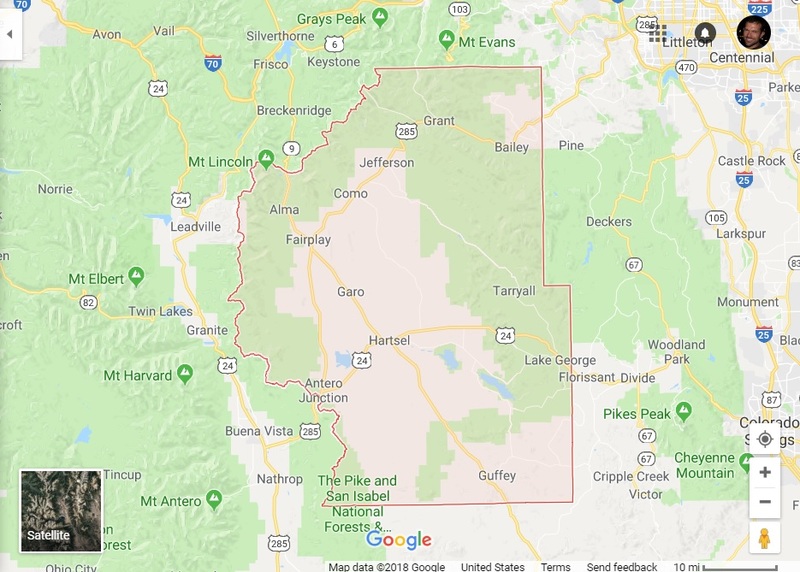 As you're scratching your head and thinking about engaging Ancestry in a Twitter-storm, you remember something about changing county boundaries that some blogger named Randy Majors seems to drone on about. You think, "Could that be relevant in this case? I doubt it because I live in Denver and I know that Denver is in Denver County." Armed with this invaluable sliver of wisdom, you return to the trusty Ancestry 1880 Census search form and edit your search. You click Search and hold your breath. Happily finding the James Smith you were looking for, you begin your next search: Robert Johnson, who lived in what is now Chicago in around 1830. That's Cook County, right? Ah, but now you can't be fooled! 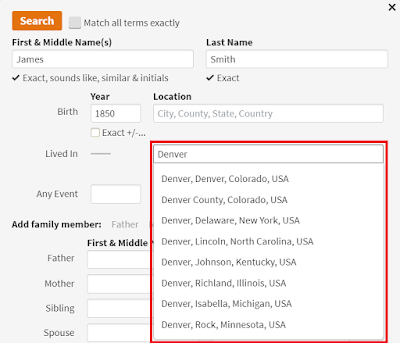 And lest you think this is a limitation of Ancestry's search, try the same thing at FamilySearch and you will get the same ZERO results for a James Smith born around 1850 if you type "Denver, Denver, Colorado" into the Residence Place box, and you will get around 10 results if you type "Denver, Arapahoe, Colorado". 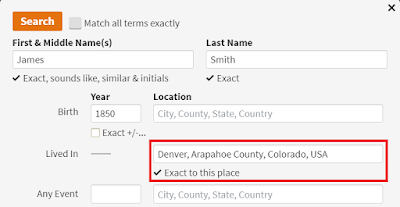 Technical side-note: My advice about typing the full place name (with the correct county) in the form "Denver, Arapahoe, Colorado, USA" applies across ALL Search forms, whether you do a global search across the entire Ancestry website or a search within a specific Collection. 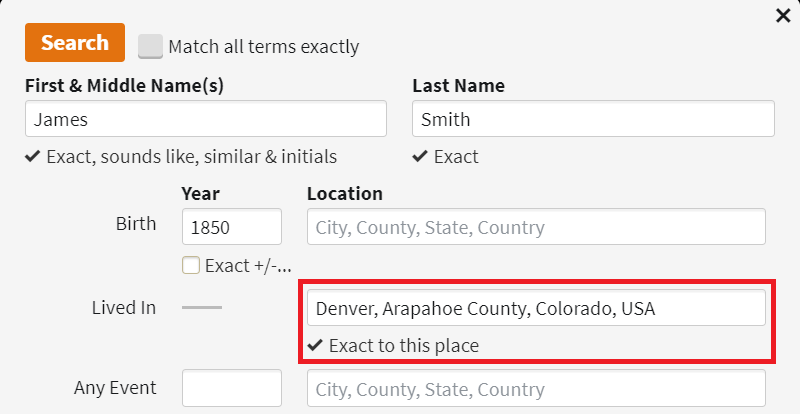 So even searching within the 1880 US Federal Census, "Denver, Denver, Colorado, USA" will automatically appear as you start typing "Denver" -- even though Arapahoe County was the only county in which Denver, Colorado existed in 1880. 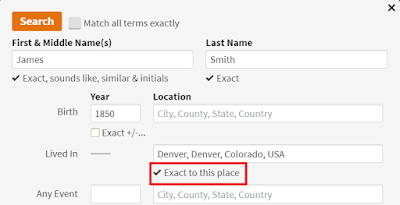 If you check an "Exact" location box when searching and get either ZERO or other very erratic results, it could very well be that you're looking in the wrong county. 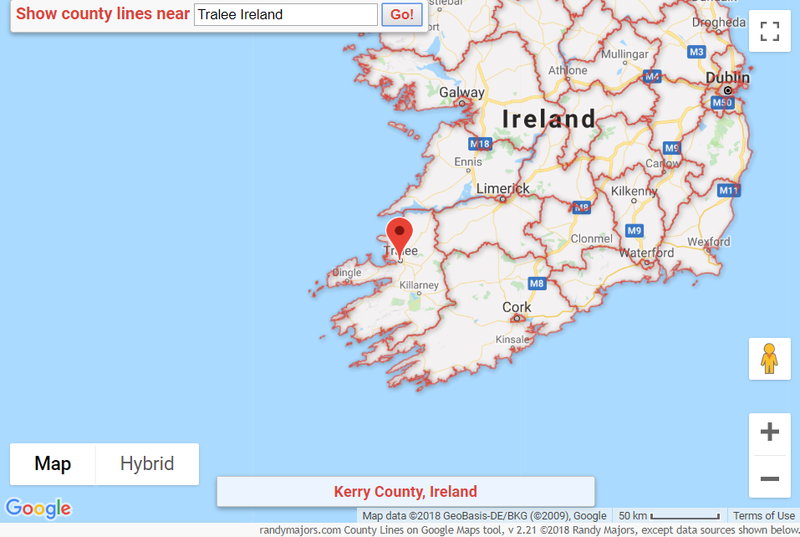 And now you know how to quickly find the right county! Enjoy!